People take part in a protest against Uber and in favour of labour rights in central London, Britain, September 27, 2017. LONDON - Uber said on Tuesday that paying National Insurance contributions for its British drivers would add tens of millions of pounds to the taxi app’s costs were they to be deemed employees. 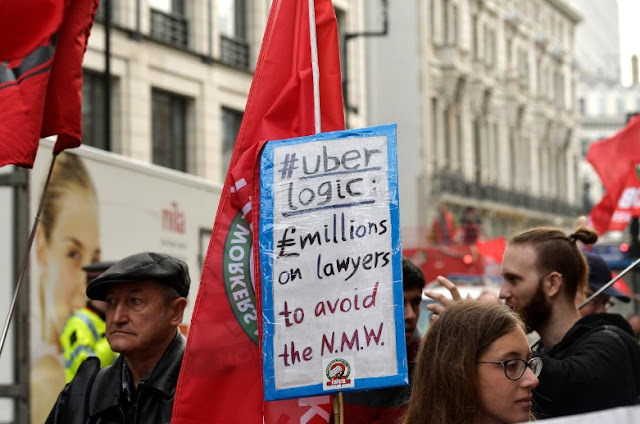 Uber currently classifies its around 50,000 drivers in Britain as self-employed, affording them only basic entitlements, whilst employees also receive rights such as sick pay and the minimum wage. Also appearing before lawmakers, Deliveroo’s UK and Ireland Managing Director Dan Warne said additional costs including National Insurance contributions, would add around 1 pound ($1.32) to the cost of each hour. National Insurance is collected by the government and helps pay for the state health service, pensions and certain other benefits. Firms operating in the so-called gig economy - whereby people tend to work for different companies without a fixed contract - have been criticized by unions and some lawmakers for what they call exploitative practices. Uber and Deliveroo both say their drivers enjoy the flexibility they offer but last year two drivers won a tribunal hearing against Uber and were granted worker rights, in a decision which the Silicon Valley firm appealed last month. Uber is also battling to overturn a decision by London’s transport regulator to strip the smartphone app of its license in the British capital. It has until Friday to lodge an appeal. Byrne said he could hopefully see a way to address concerns by London’s transport regulator, which cited the firm’s approach to reporting serious criminal offences and background checks on drivers. “Hopefully we can see a path forward now with TfL (Transport for London) where we can address their concerns and continue to operate,” he said. Uber said on Tuesday that paying National Insurance contributions for its British drivers would add tens of millions of pounds to the taxi app’s costs were they to be deemed employees.